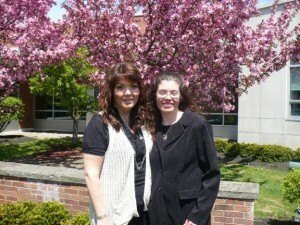 Cayuga Community College alumna Michelle Wiggins McMahon ’94 of Syracuse (right) presented nursing student Vicki L. Pasco ’12 of Oswego (left) with the Thomas James Wiggins Sr. Memorial Scholarship on May 12 during the Nursing Moving Up Ceremony at the Auburn Campus. Thomas J. Wiggins Sr. was a one-year-old when he was first diagnosed with cancer. Over the next 68 years, he would face 16 episodes of eight different kinds of cancer and blindness. He fought hard to recover quickly after having a tumor removed from his knee in 1998, so he could walk his daughter down the aisle at her wedding a few weeks later. After leading a courageous and inspirational life, he died last September. To carry on the memory of her father, McMahon, a nurse, established a $500 scholarship for a second-year nursing student who is an inspiration to others in the program and who has overcome adversity in pursuit of his or her degree. McMahon presented the first ever Thomas James Wiggins Sr. Memorial Scholarship to Cayuga second-year nursing student Vicki L. Pasco of Oswego. Pasco was one of nine rising sophomore, nursing students who received scholarships and awards during a celebration lunch on May 12 in the student lounge on the Auburn Campus. The lunch and awards banquet was part of the “moving up” ceremony for students who have completed the first year of the two-year nursing program. “You have reached the half-way point on your journey to success,” said Professor Linda Alfieri, director of the nursing program. Reading from a Barbara Cage poem, Alfieri reminded students: “The path to a dream is paved with sacrifices and lined with determination.” Then she congratulated them on their successes so far, and introduced the scholarship and award winners, several of whom were greeted by the donors who established the awards. “Congratulations and good luck!” Robert Gallager told Lisa L. Kimak ’12, who received the Anne Drancsak Gallager Memorial Scholarship, a $1,898 award Robert Gallager established in his wife’s memory. Kimak of Elbridge also received the first-ever Alfieri and McColgin Nursing Excellence Award, a $500 scholarship given to a rising sophomore nursing student who demonstrates a spirit of inquiry and passion for the pursuit of excellence. Sisters Betty Thurston and Sylvia Thurston presented an award they created and manage in their mother’s honor. Amanda Woodmansee ’12 of Auburn received a bouquet of pink roses, a hug, and the $300 Elizabeth Thurston Memorial Award from the Thurston sisters. Nurses Lynn French, Alicyn Salato, and Linda Morabito presented the $400 Nancy McGohan ’82 Memorial Nursing Scholarship to Johanna K. Dalton of Auburn. The award pays tribute to a student who has the “patience, therapeutic sense of humor, and qualities” of McGohan, a nurse at Auburn Memorial Hospital who died last July from a brain aneurysm. Cayuga nursing graduates have a promising future. In recent years, graduates from the program have had a nearly 100 percent placement rate, meaning the nursing graduates who seek employment find employment. The job market and starting salary are strong for registered nurses. Registered nursing positions will grow faster than most other careers through 2018—at a growth rate of 39 percent in physician offices, 39 percent in home healthcare services, 34 percent in outpatient centers, and 22 percent in hospitals, according to the U.S. Bureau of Labor Statistics. The average RN starting salary in the Syracuse area ranges from $17.75 to $27 an hour or approximately $36,920 to $56,160 a year, according to PayScale.com. To learn more about the College nursing program, contact Linda Alfieri at 315-255-1743, ext. 2384 or [email protected]. For more information about supporting Cayuga Community College students, contact Jeffrey Hoffman, executive director of the College Foundation, at 315-255-1743, ext. 2327 or [email protected].